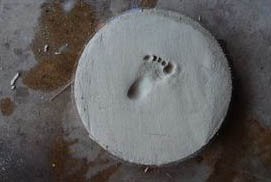 Making stepping stones with baby handprints or footprints is a very unique way to chart the growth of a child through the years. We create a cement stepping stone of my son's footprint every year on his birthday and will soon have a whole path of his prints running through our garden. A single stepping stone makes a lovely gift for grandparents and can include handprints or footprints of all the children in the family. Many young couples do not live in their "forever home" when they start a family so putting names and handprints in the newly poured driveway (like we did when I was a kid) is out of the question. 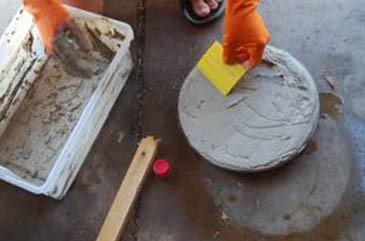 Making stepping stones is a perfect alternative because you can take them with you whenever you move. Cement is cool. You mix dry cement with water, pour it into a mold, make an impression, put mosaic tiles or stones in it and then it turns hard and you unmold. 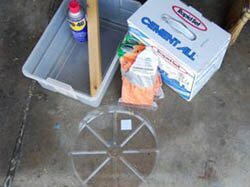 Easy and quick results, my kind of crafting! Mix the cement according to the package direction. Meanwhile, spray your mold with WD40 or olive oil. 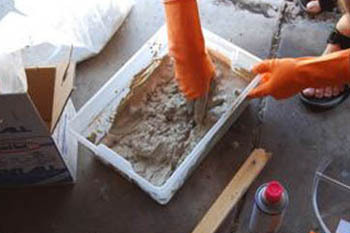 Pour cement into mold and then smooth the surface with something like a spatula, credit card or spackle plastic thingy. You want to work fast before the cement starts to dry, a spray water bottle is handy for slow pokes. Next get baby ready by putting olive oil on his/her hand or foot and then gently press it into the cement. From first hand experience with younger babies, getting a good foot impression is a lot easier than getting a hand one because some babies will just grab chunks of the cement! If it gets messed up, no worries, just act quickly and smooth it out again to start over. Let the cement dry for a few days then remove from the mold. Ours slipped right out and was still oily from the WD40. Finally, you can paint the cement if you like or leave it as is. When you install your stepping stone in the ground, make sure you dig out an even surface for it, free of rocks. Even thick cement can crack if it is balanced on a big rock and weight is put on it. 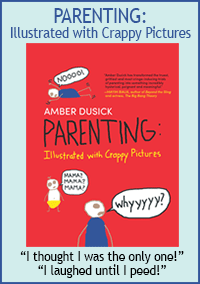 Enjoy making stepping stones with baby handprints or footprints and remember that as with all of our tutorials, these are just jumping off points! Get creative and add names, dates, mosaic tiles and more!